All your videos now on Skyrock! We've added a new video feature on Skyrock.com! ★ ﻿﻿Check out the TOP BUZZ, the most popular videos on Skyrock! CREATE YOUR OWN VIDEO ALBUM! ﻿Now you can create your own video albums on your profile! Just click on the video tab on your profile and create your album. Just shoot a video with your webcam ("Use webcam") or add your favorite videos ("Add a video"). If you already have a Dailymotion account, you can easily upload your videos from your computer or share all the ones that you've added to your Dailymotion account! Wanna add a videowall to your blog? You have two options: you can create one directly from Dailymotion OR you can create when writing your article by clicking on "Add a widget." Now you can see all our widget options and you have 3 options from Dailymotion: Videozap, Videowall, and Jukebox. Click on Visit the Dailymotion Videowall (or Videozap or Jukebox.) Follow the directions and click on "Generate the code." And... you have a videowall! Give your blog a boost with multimedia articles! In response to the many many requests for this feature... we've added it!! Starting now, add up to 8 different media files to your articles. Combine several images, videos or widgets in one single article! 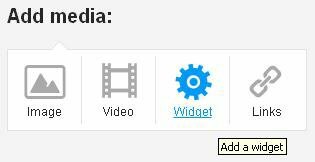 It's super easy: create an article and add images, videos and widgets with the help of the "Add media" buttons. Be the first to take advantage of this new feature and write a new article and leave us the link in our comments: we'll post the most original articles HERE! Like a video you found under our Top Music Blogs and want to add it to your blog? Choose the video you like simply by clicking on to the right below the video. The video will appear directly in your new article! -Finish by clicking on send. Next, you can add text to your video if you want, but don't forget to save your article once you've finished. Have a favorite Skyrock video? Let us know what you think! Add VIMEO videos to your articles! We've got some great news: you can now add VIMEO videos to your articles! When you find a video you like on Vimeo.com, simply copy the link from the address bar of your browser. When writing an article on Skyrock make sure 'Video' is selected under 'What do you want to add to this article', click continue and paste the VIMEO link into the 'Add a video' field. Found a video you love? Add it to your blog! No more trawling through 15 pages to find that photo or video you've been looking for - in just one click everything is displayed for you on one single page! Share your videos and widgets ! Share your article containing a video or widget with friends as soon as it is published. When posting an article with a video or a widget simply click the 'Send this article to a friend' button. A new page will open up with the list of all your friends - all you need to do is choose! You can always edit your article once the link is sent! Great, don't you think ? Add your favorite videos and widgets to your blog ! There's another cool blog function you may not know about - links on all videos and widgets. Thanks to these links you can add the videos (Youtube,Dailymotion...) or widgets (GoogleMaps, Pixule...) that you love directly to your blog. All you need to do (ensuring you are logged in at the time) is click on the 'Add this video to my blog' / 'Add this widget to my blog' link and a blog article will automatically be created! Give it a go and let us know ! 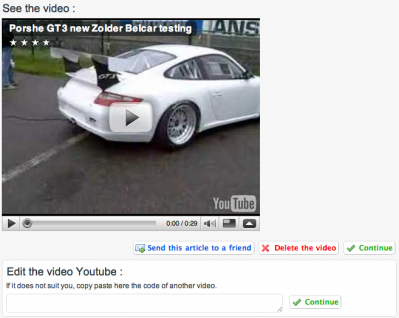 It's easy to add external videos to your articles thanks to the external video page.